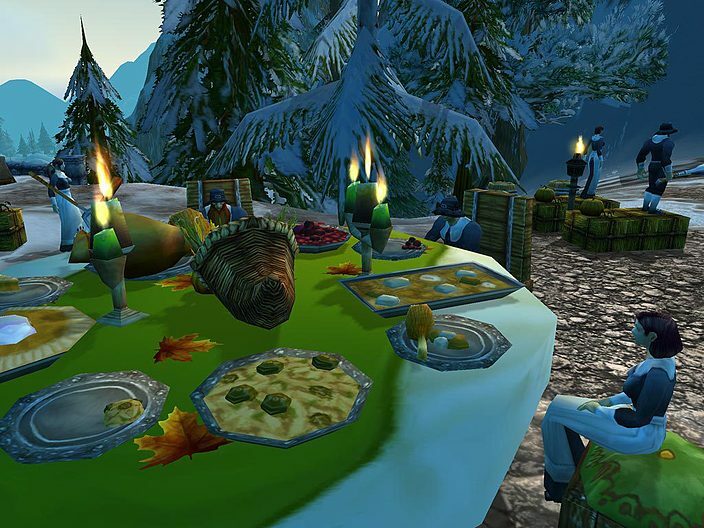 Pull up a chair, grab a sizable helping of your favorite food, and prepare to reflect on the year's good tidings -- you're invited to Pilgrim's Bounty! The festivities start this Sunday, November 21, and continue all the way through next Saturday, November 27. Try your hand at cooking, hunt down a wild turkey with friends, or throw tradition to the wind and participate in an all-out food fight. There's fun for everyone, so we hope to see you there! 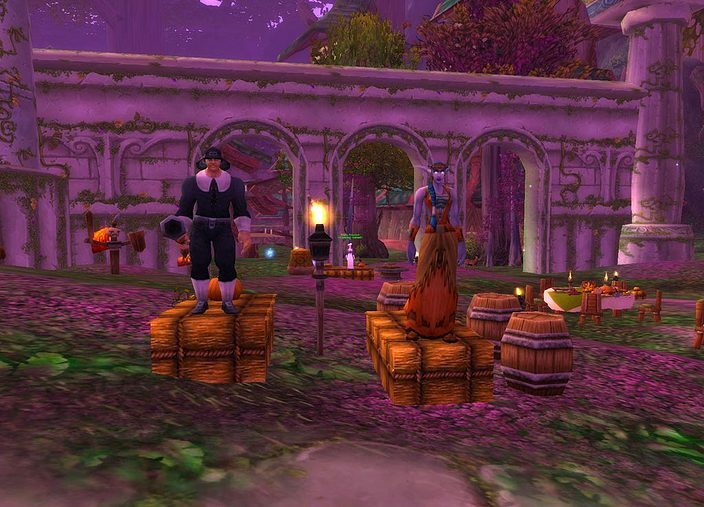 Bountiful Tables are the centerpiece of the Pilgrim's Bounty celebration. They're loaded with tasty treats and surrounded by interactive chairs that allow you to eat and share food with other players via the action bar. 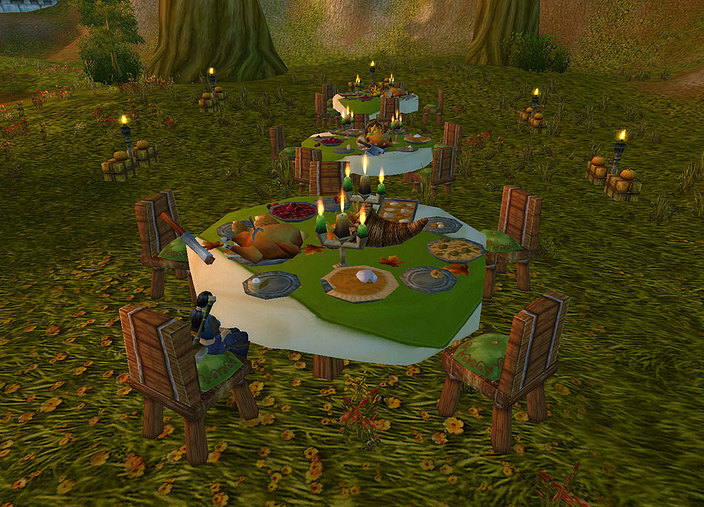 A Bountiful Table is laid out with five different Pilgrim's Bounty foods, one in front of each chair. Each chair has an unlimited supply of one food, and they are conveniently labeled: The Sweet Potato Chair, The Turkey Chair, The Stuffing Chair, The Cranberry Chair, and The Pie Chair. While in a chair, you may eat as much of that food as you like, as well as pass servings of that food to other players sitting in the chairs. 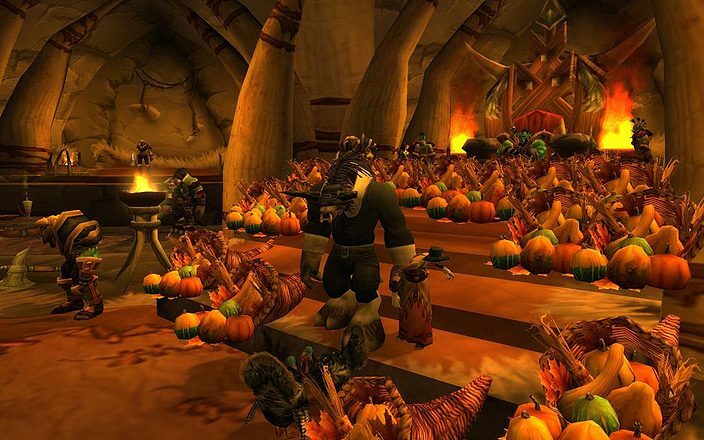 Share the bountiful feasts with your friends! If you eat five helpings of any single food, you'll gain benefits unique to that food. In addition, if you eat five helpings of every food, you'll gain the Spirit of Sharing, which lasts one hour and increases all reputation gained by 10%. This is accomplished much faster if you work together with your fellow feasters at passing food to one another. Pilgrim's Bounty also plays host to a series of daily cooking quests designed to help chefs master their craft with seasonal recipes plucked from a Bountiful Cookbook. 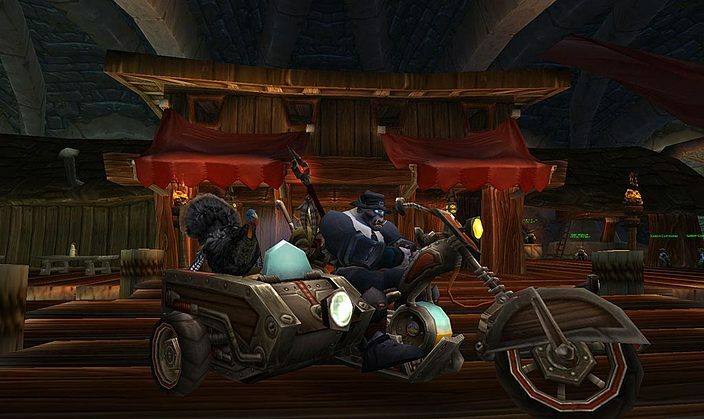 These quests require players to travel between the major cities of Azeroth and to fill the stomachs of armies with seasonal food. The reward for these quests is a Turkey Caller, a prize that ensures that the accomplished pilgrim will never go hungry again. 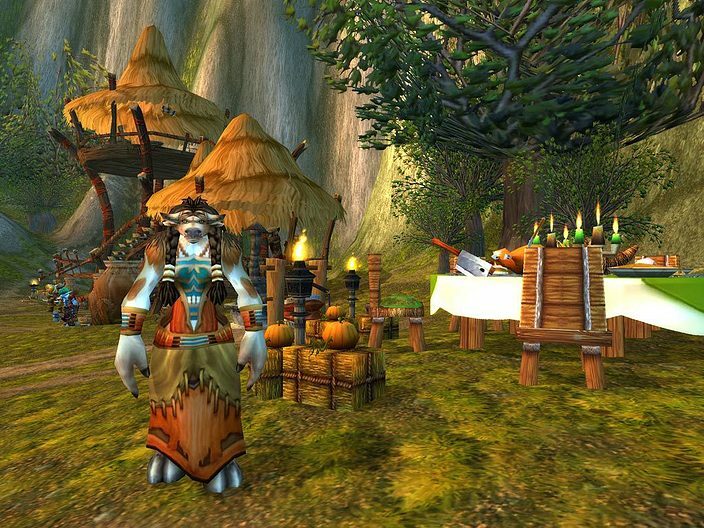 If you're interested in learning the Pilgrim's Bounty's recipes, speak with an NPC outside any major city. Stuffing and potatoes are easy enough to put in front of a fire, but if you want to cook a turkey, you'll need to catch one first. Un-sling your trusty Turkey Shooter and prepare for the hunt. 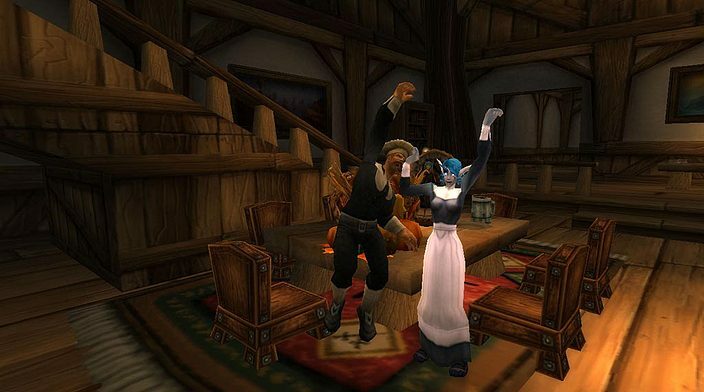 While we understand that this is a troubling time for Azeroth, we still encourage everyone -- perhaps while you're fleeing from those rampaging elementals -- to sit down and enjoy the holiday's tidings. 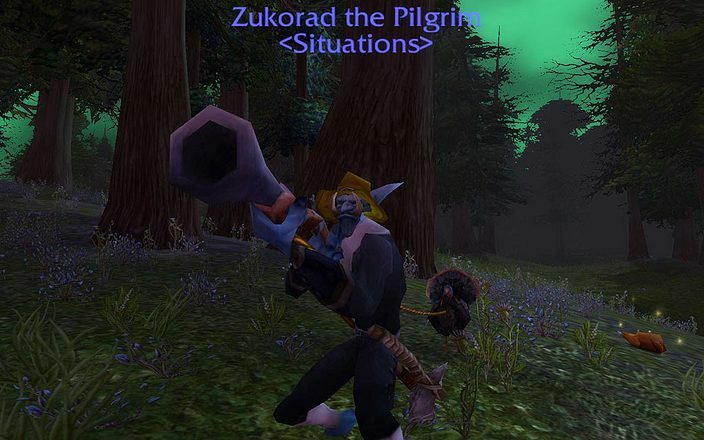 After all, if you don't give thanks for all the good things in your life, the Twilight's Hammer cultists win.